Concrete Classics was born as the product of a passion for the game of chess played by two brothers, Josh and Noah Levine. Since childhood the brothers would use chess as a way to clear their minds and relax. While playing chess in Washington Square Park, New York, NY, they realized how much they enjoyed using the concrete chess tables there. Then it clicked! 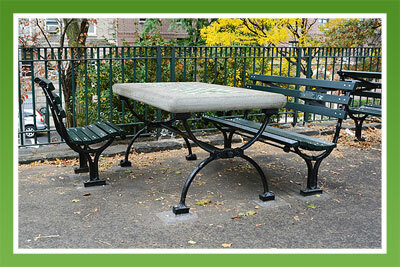 Many other people know and love these tables, but had never seen them for sale to the public. Raised in a family of entrepreneurs it seemed natural for them to start a business selling these tables. The business grew as they had expected and they enjoyed bringing the game of chess outdoors to many libraries, schools and chess clubs across the country. In 2010 Josh Levine passed away to an unexpected tragedy. The business continued on within the family as a tribute to his admiration for the game of chess. In 2013 the Concrete Classics business changed ownership to continue the great leadership that Josh had provided in the developmental years. Concrete Classics current owners are the actual producers of the product. After a successful 8-year partnership with the Levine family it was a seamless transition to handling all aspects of the business. We are now able to offer additional park products, more customization options and a streamlined ordering process. We welcome you to review our product line and make an inquiry for customization options and freight costs.